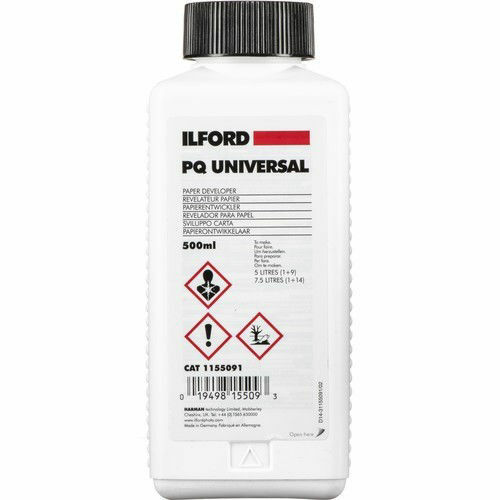 Ilford PQ Universal Paper and Film Developer, is a liquid concentrate developer suitable for dish or tray developing of all resin coated (RC) and fiber based (FB) black and white photographic papers. It is a dimezones/hydroquinone derivative. As opposed to Ilford Multigrade developer, this developer will yield a slightly warmer tone. PQ developer has excellent keeping properties. In addition PQ Universal can be used to dish or tray process Ilford and other manufacturer's technical films. It is also suitable for dish or tray developing of general purpose sheet films when you require a rapid working, high contrast developer. This developer works well when a high degree of enlargement is not required. Box Dimensions (LxWxH) 6.8 x 2.8 x 2.0"